The National Centre for Craft & Design confirms that “Alexis Rago: Chaos Contained” has begun its life as a touring show in Farnham. Originally curated by Laura Mabbutt for the NCCD, the exhibition opened at the Crafts Study Centre on 7th January 2014 and continues until 1st March. 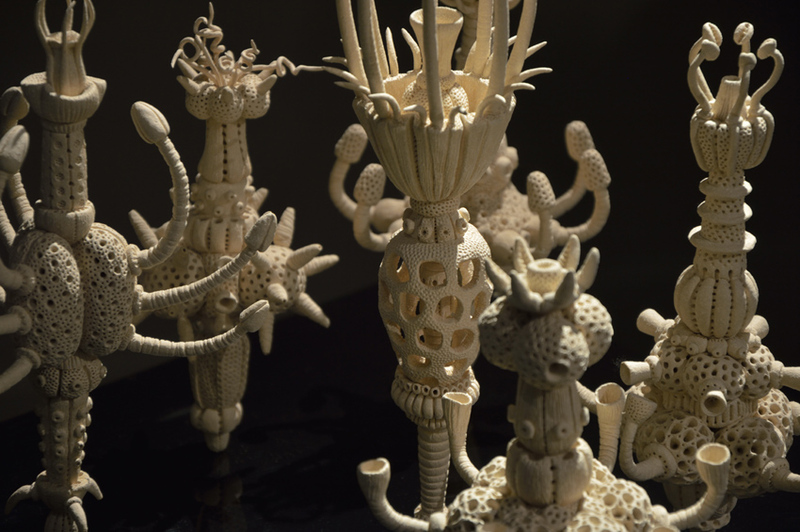 Rago worked as a biologist and his artwork is inspired by the Cambrian explosion, when diverse life forms rapidly evolved. He hand crafts his sculptures, allowing them to take shape while he works, and incorporating the imperfections characteristic of work created by the human hand. 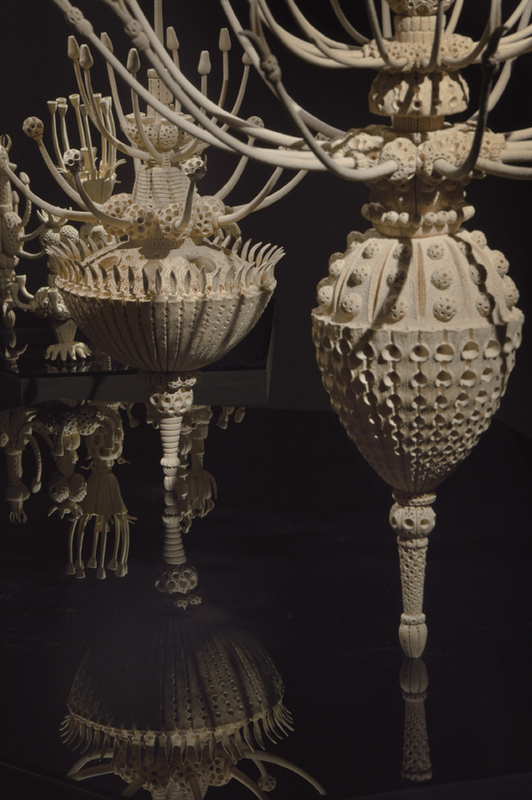 For Chaos Contained, Rago created brand new technically challenging and large scale ceramic works, with integrated media, such as digital sound and projected imagery. A video of Rago describing the work as he created it explains his thoughts, creative processes and techniques. 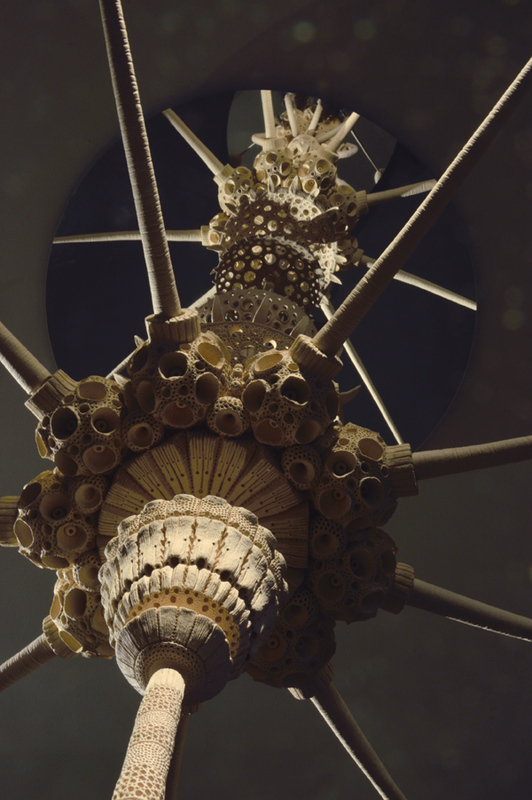 The exhibition has received critical acclaim, with the New Scientist describing it as “Beautiful Biology… pure fantasy… a collection of intricate, totem-like clay sculptures that look as if they are made from natural organisms”. Elements from the exhibition formed a key part of the Frequency Digital Festival, which took place in Lincoln in October 2013. Public praise for Chaos Contained, captured in the gallery comment book, includes “serene, elegant, fascinating and wonderful”, “Beautiful, life-affirming – a delight”, and “Superb! Biologist myself – love the forms”. It has inspired art students to take up clay work and children to complete wonderment: “Fantastic, my little girl was mesmerised and spent time considering how they [the forms]stand up, she is only seven”. The Crafts Study Centre is located at the University for the Creative Arts, Falkner Road, Farnham, Surrey GU9 7DS. Opening times are Tuesday to Friday 10am to 5pm and on Saturday 10am to 4pm. Visit www.csc.ucreative.ac.uk or telephone 01252 891450.